That'd be Schindler, I think. Anyway, good work. I might play FE12 someday now. Never mind...found exactly what I needed. Took an additional patch for the OS X version, but it's up and running beautifully. Is it just the patch or just the full game with the patch? Such a shame I can't actually play it until I get a computer going again. Nuts. The patch. You'll need to get the rom yourself. Sweet! Thank you, everyone who worked on this. You did a real good job with this. This has gotten me pretty excited. The translation is very good, I love Luke's personality. I also found another glitch, like Nyna, Lang also has a square on his mug in the character chart. Does male MU get the "Quite a few people seem to secretly lust after #charname too" line? Awesome! I really didn't expect this to be done so soon in spite of the updates. yes, but i believe its in a different manner. Excuse me, I'll be gently weeping in a corner somewhere. Anywhere I can just view the supports/base conversations? It seems that you forgot to shorten some of the weapon names for the enemy forges. 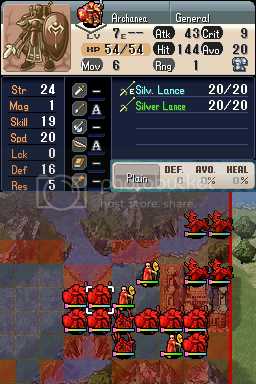 Unless I'm mistaken, all modes get forges eventually, it's just that Lunatic gets them sooner. Could have sworn I'd read that somewhere. Well, I can't confirm myself, because I haven't gotten that far in normal mode yet. Either way, I'm completely certain that hard mode has forged weapons, and that Lunatic mode makes them get the forges sooner than Hard mode. Note : Being completely certain does not guard against being wrong. Glad to see more ppl will be playing this FE. I think it's one of the best FEs and it has something for everyone. If someone wants to play on normal/casual mode and write about it here, more power to them.